Mary Murray, Mary Wattum (in front), and Duncan MacKenzie. Alex Jappy was absent. Branch Chair Elizabeth Peerless presented Branch Awards at the Burns Supper January 2006 to ten recipients. Ron Arrowsmith has been a dancer and teacher in Vancouver for at least 20 years and he currently teaches the Kerrisdale Club. He is an avid dance composer and you have all danced at least one of his dances, “The Royal Deeside Railway,” published in Book 40. Rosemary Coupe has edited the White Cockade since 1996. She has involved herself with every aspect of Branch activities, teaching, dancing in the Demonstration Team, teaching at workshops, and assisting tutoring teacher candidates. Alex and Ruth Jappy are a dynamic duo. Ruth is an inspirational teacher who manages to make the most complex dance seem simple and Alex can play anything at a moment’s notice. They are a remarkable team providing so much pleasure locally, nationally and internationally with their dance/music collaboration. May Loudon has had a long association with the Branch as Teacher Coordinator and serving on the Board. She has taught the very successful Gleneagles Club for almost 30 years. Anyone who has been to the Gleneagles Ball knows that it is an annual highlight. Duncan MacKenzie. Who hasn’t met Duncan in some sort of capacity with Scottish dancing in Vancouver? He teaches, has chaired the Board, danced on the Demonstration Team, chaired committees of very successful events, initiated and run the Friday Ceilidhs. His enthusiasm and willingness to support dance activities seem boundless. Mary Murray’s contribution to dancing excellence is local, national and international. Mary is a Branch teacher, tutors teacher candidates, is now an examiner, teaches summer school at St Andrews and is in constant demand for workshops. 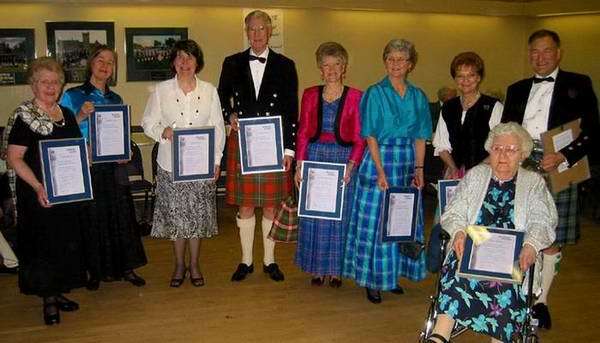 In 2000 she received the Scroll of Honour from the RSCDS in Scotland. Elspeth Rennie is a quiet “behind the scenes” person. She has been on the Board and served on many committees with an ongoing interest in the Children’s Committee. Those of us who attended the early Pearl Holmberg workshops, for which she was Co-Chair, know the amount of effort involved. She attends virtually all Branch events and is always willing to help in any capacity. Hellen Stephen has been with the Branch since its inception, has chaired the Board, has been a demonstration team member, and has taught for 25 years, currently with the West Vancouver Seniors. She is Branch librarian, amassing an increasing library of dances which she makes readily available to teachers and Branch members. Mary Wattum danced first with Mrs. Bingham and then with Vancouver Branch after its formation in 1964. Mary, although unable to dance any more, continues to support the Branch and dance events. We thank her so much for her generosity which assists with annual events like the Betwixt and Between and has made possible such wonderful events as the Millennium, Pacific Spirit and Thistle Balls.